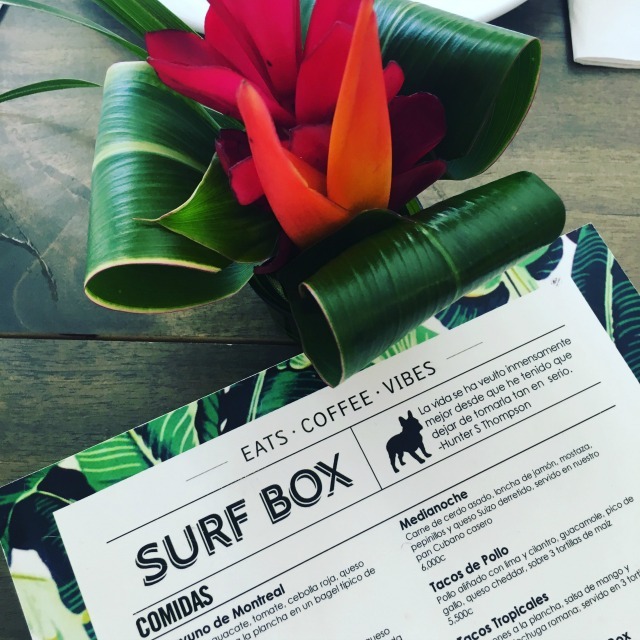 If you’re visiting the beaches of Guanacaste, Costa Rica or staying around the Playa Flamingo area and need a coffee fix, you’ll definitely want to stop at Surf Box. Chances are you’ll find me and my husband hanging out there, along with a bunch of other local expats. This is our neighborhood Starbucks, but SO much better. 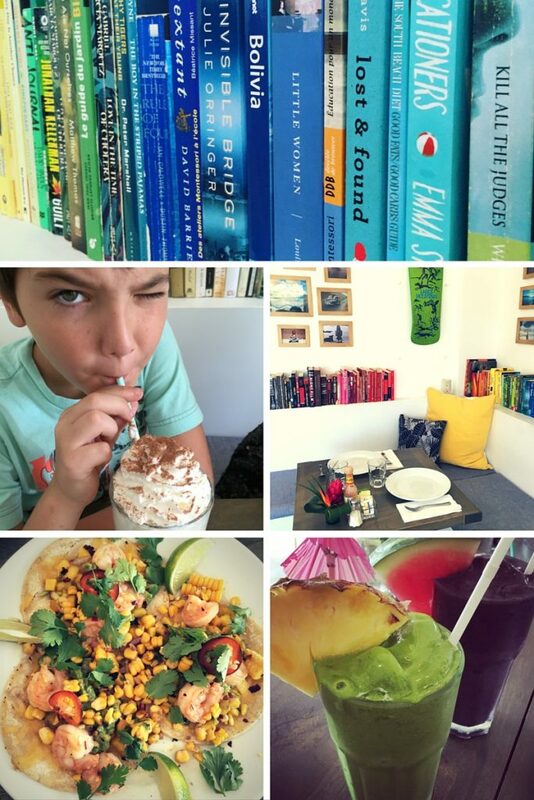 Surf Box has only been open for about six months but has quickly become the hot spot in our little beachside community. The owners are an adorable expat couple, Dan and Natasha. Dan is from New York City and Natasha is originally from Montreal. They opened Surf Box out of Dan’s frustration to find a decent cup of coffee and a comfortable place to sit down and enjoy it. Natasha thought there was also a need for fresh, healthy food that she was used to in Montreal, not to mention a place to just get a good quality bagel. To my surprise, neither one of them has ever owned or operated a restaurant before, but this idea for a great coffee shop and cafe just kept coming back to them. Finding a location was a challenge but when they happened upon a small space right off the main road they immediately saw the potential. The restaurant interior is small, like a little box, with only five tables – but it’s totally air conditioned! This is exciting for those of us that need to escape the heat and get a little work done from our laptops. 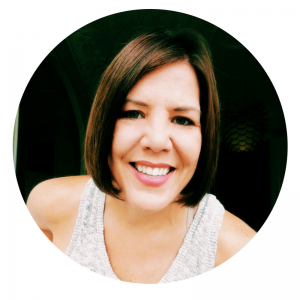 Restaurants in Costa Rica are mostly all open-air, so finding one with four walls and air conditioning can be more difficult than you might think. There is also a patio outside that has three large community style tables for sharing or for larger groups. You can order your espresso and sip it right at the counter or order anything off their menu to go. You can leave a book or take a book from the Surf Box community bookshelf (color coded of course). So great, the restaurant is cute, but what about the food!? Well, that’s even better! The menu might be small but it’s packed with goodness. For breakfast I am always torn between the Acai bowl and The Mexicana, fluffy scrambled eggs covered in pico de gallo with jalapenos piled on a piece of thick,multi-grain bread. They also make some pretty insane tasting french toast, waffles and have a variety of delicious smoothies. For lunch I always go for the tropical shrimp tacos, but the quinoa salad is tasty too! You really can’t go wrong with any of their food. Trust me, I think I’ve had everything! 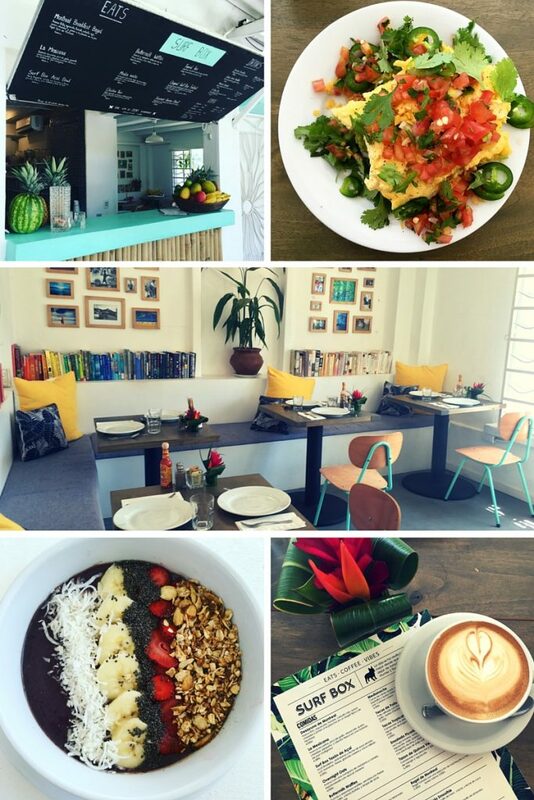 Follow SurfBoxCR on Instagram to get your daily dose of “good eats, good coffee and good vibes”! I’ll have to check this place out when we are back in Tamarindo in January! Those books look like a pretty good selection – loved The Vacationers.